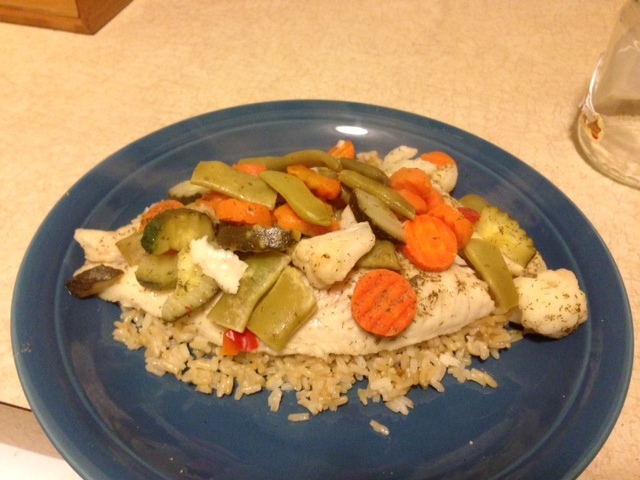 Super Easy, Super Clean, Super Healthy Fish Recipe! 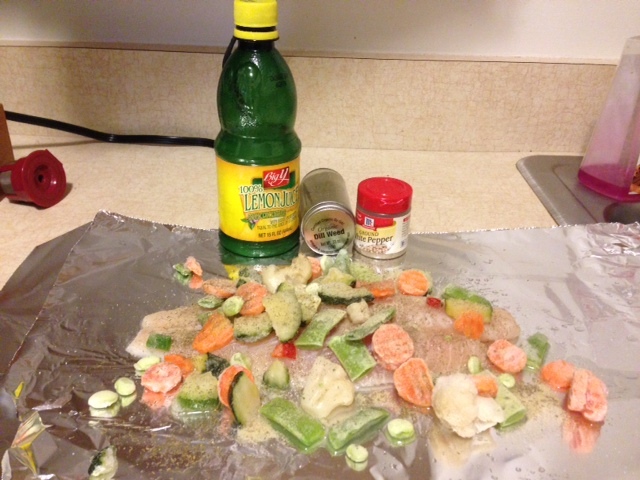 Take a piece of tin foil and fold it in half (make sure you leave enough “slack” that once you add the fish and veggies you can still wrap the foil around everything without a problem. 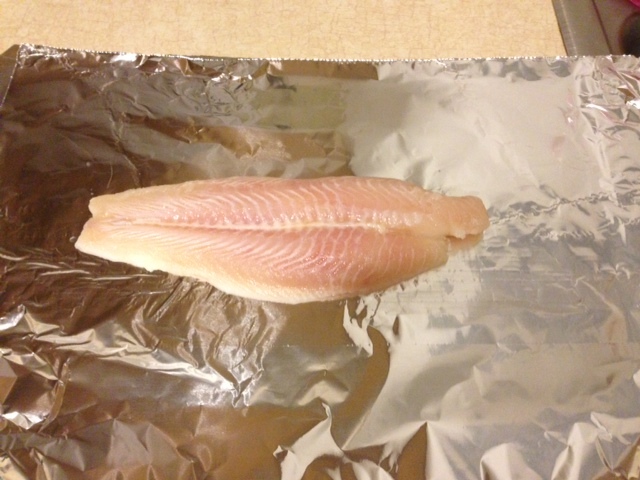 Put the fish in the middle of the foil unseasoned. Add veggies – as many or as few as you want to eat. The more veggies the better in my book! As you can see, my veggies are frozen – thats fine, they’ll thaw out while cooking, no big deal. Add seasoning. I poured some lemon juice over everything then sprinkled with dill and white pepper. Then some regular salt and pepper. I didn’t use any formal measurements – just “eyeballed” it. Yes, I realize this could be dangerous, but erred on the side of caution – I’d rather have it be too bland than inedible. wrap that puppy up! 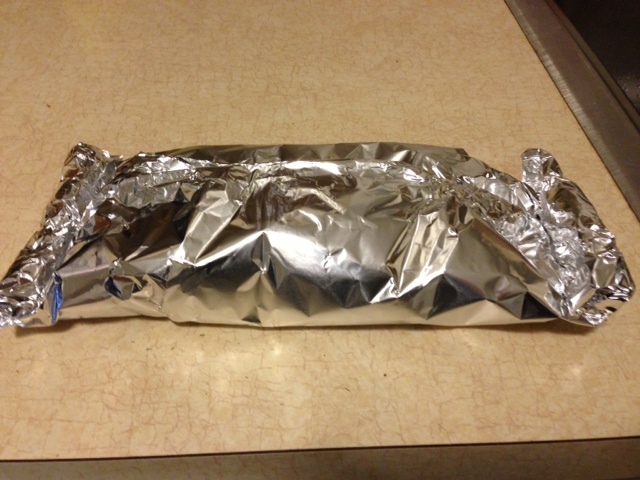 Make sure you have it wrapped well so no juices will seep out while it’s cooking. You could also place it on a baking dish if you’re nervous. I didn’t do that though…I like to live on the edge. 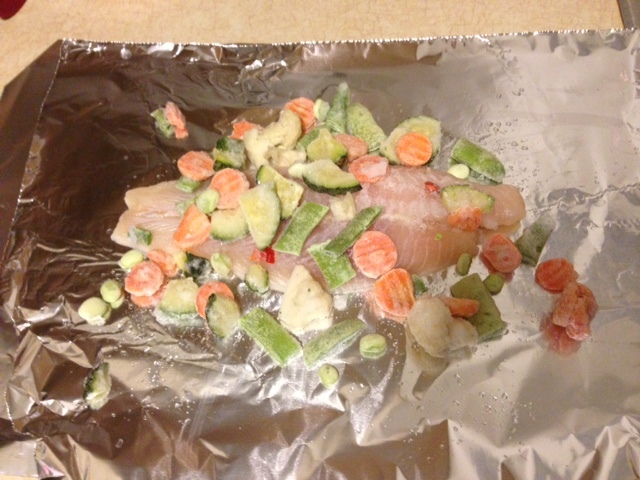 Bake for 20 – 30 minutes, or until fish is cooked through, and voila! you’ve got yourself a healthy, simple, easy-clean-up dinner! So you can alter this recipe to fit your own person tastes! Add any veggies or spices that you like, and if you don’t like rice, you could have pasta, baked potato or anything else your heart desires for a side! The world is your oyster! Bon Apetite!